According to the American Automobile Association (AAA), most drivers admit that they have expressed road rage while behind the wheel. Aggressive honking, tailgating, and cutting drivers off are all road-rage behaviors that often contribute to accidents. An even scarier form of road rage emerges when the driver is armed. 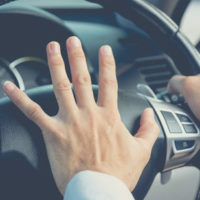 In February 2018, a female driver changed lanes in front of a male driver, who, she says, angrily honked his horn and flipped his middle finger. As they neared the intersection of South Tamiami Trail and Stickney Point Road in Sarasota, the man allegedly got out of his car, tapped on the woman’s window, and pointed a gun at her. According to the police report he said, “Hey girl, you better think again before doing something like that,” before getting back into his car and leaving the scene. The 76-year-old driver is currently in jail and facing several criminal charges. If the female driver had been injured in the incident, he might also be facing civil charges. Gun-related road rage incidents are on the rise, according to a recent study. Specifically, the study found that such incidents more than doubled between 2014 and 2016, and that the most road rage incidents involving guns — 146 cases — happened in Florida. Guns are not the only weapons wielded by aggressive drivers. In January 2018, a 34-year-old man became angry when another driver allegedly cut him off in Zephyrhills. Later that night the 34-year-old pulled up beside the other driver and “swung a sword” at him, according to police reports. The victim’s hand was injured in the incident, and the alleged aggressor is facing criminal charges. Even though the incident didn’t result in an accident, the victim potentially has a personal injury claim against the alleged aggressor. In June 2017, a man reported a car crash on Interstate-95 in Riviera Beach. According to the Florida Highway Patrol, the call cut off while they were taking the man’s statement. Then a second caller phoned in to report a fight on the right shoulder of the interstate. Police arrived on the scene to find two vehicles and a 26-year-old man with multiple stab wounds. They found both a knife and a gun at the accident scene. The victim was taken to the hospital but died from his injuries. Not every road rage incident results in a crash or involves weapons, but such aggression is a contributing factor in far too many accidents. An experienced attorney can examine the facts of a personal injury or wrongful death case and help file a lawsuit on the victim’s behalf. Contact a car injury attorney in Orlando at The Pendas Law Firm today for a free consultation if you or a loved one is injured or killed in a road rage-related accident. Our experienced attorneys will help recover compensation for your injuries, including medical expenses, pain and suffering, and property damage. The Pendas Law Firm also represents clients in the Fort Myers, Fort Lauderdale, Orlando, Jacksonville, West Palm Beach, Tampa, Daytona Beach and Bradenton areas.